A native to southwestern U.S., Texas, and Mexico. Tall to medium size tree up to 30'. Often multi-trunked with a weeping habit. Leaves are a lime-green in color, pinnately-twice compound, with pinnae in one to several pairs. Leaflets 4 to 30 per pinnae. Leaves emerge late, usually after the last frost. Spines slender but strong, 1/4" to 1 1/2" long, tapering gradually from base to sharp apex. Flowers in spring are fragrant and yellow to white in color. Fruit is a tough, leathery, seed pod. 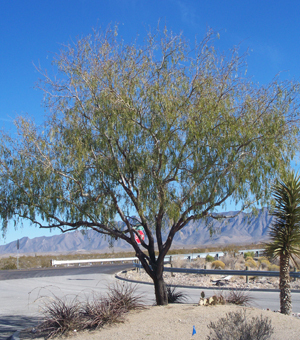 The delicate weeping foliage, interesting asymmetrical form, and extreme drought tolerance makes this a great tree for the desert southwest. The seed pods are slightly sweet and can be ground into a flour. Cattle love to eat the seed pods and have assisted in the proliferation of this tree.